I'm done and moving on and continuing to do what I love! That's all I have to say about that! Chris styled Fox's hair for the first time. If I had known how incredibly handsome this would make Fox look I would have started styling it long ago! 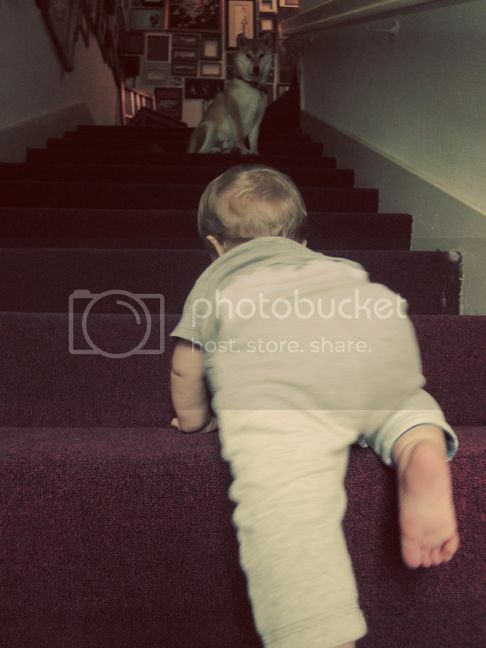 Then Fox climbed the stairs for the very first time! The prize at the top: a Joey! And theeeen, we hired our very first teenage babysitter so we could go see Harry Potter! Yeah... Fox is 10 months old and we've only left him with friends of ours or our parents a handful of times... Maybe we're a little overprotective, I dunno, but I DO know that Fox's facial expression in the above left photo is priceless! Luckily it wasn't any indication of his behavior. 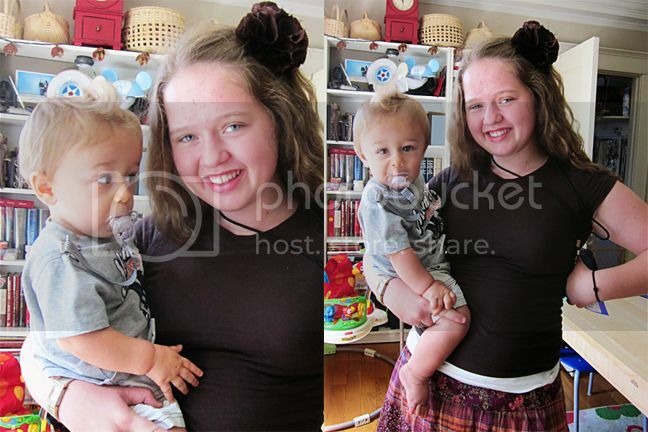 He was an angel and only cried when he saw us walk in the door. Kind of opposite of what we expected, but whatevs, as long as he was a good boy! Don't feel overprotective. Miles is 28 months and I've never left him with a teenage babysitter. That has a lot more to do with living so close to family and then living in an area with very, very few teenagers, but still. So cute!! 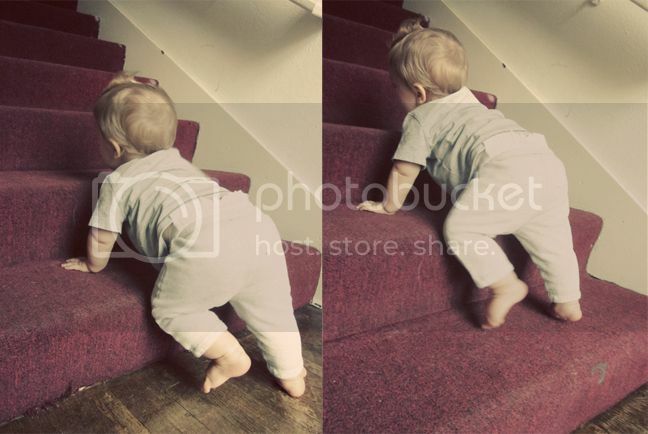 Love his new hair do and the stair climbing pics are adorable. He is so cute! That look at the babysitter is too funny! Look at that hair too cool! Your little man is quite a charmer! LOVE the pics!! love the hair!! he and jack have matchy-matchy faux hawks. twins!!! Love the hair! Hahaha - hey, we're the same - we only got to watch HP7 cuz Andy's cousins were visiting and Jordan is asleep from 10 PM and on. HA! Did you LOVE HP7? can't believe it's over! sad face. That hair!! LOL :) Super cute! 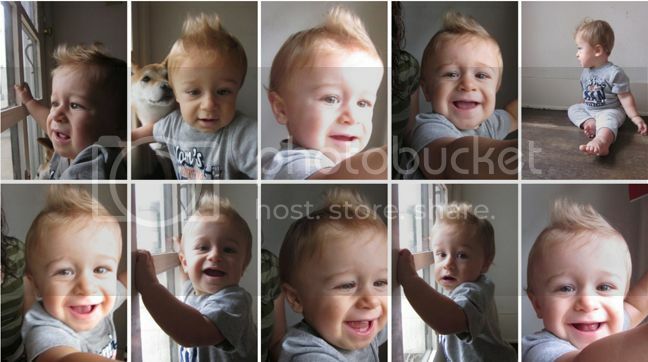 :) he's just the most adorable kid i've ever seen. 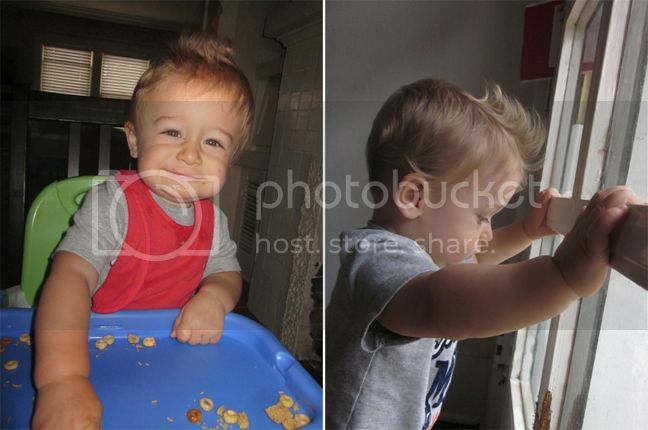 seriously, too cute, love the fauxhawk. as for your past blog, i would just like to say that there isnt a mean thing in the world that people say that should get you down. even though its been a minute or so since we have seen each other, you were and obviously have continued to be an amazing person, mother, and crafter! some people have nothing better to do then make others feel badly about themselves, it is them that need self improvement, not you. keep blogging, and living your life! you are great at both of those things. Too cute! Those babysitter pics are PRICELESS! I want a Harry Potter post soon!